Carl G. Lotave was born in Jönköping, Småland, Sweden. He studied art in Stockholm with Birger Sandzén at the Artists’ League Painting School and also in Paris. Lotave, like Sandzén, studied with Anders Zorn. He became a successful portrait painter in Europe before coming to the United States. Birger Sandzén recommended Lotave as a possible Bethany College (Lindsborg, Kansas) art teacher to Dr. Carl A. Swensson when fellow artist Olof Grafström left Bethany to teach at Augustana College at Rock Island. 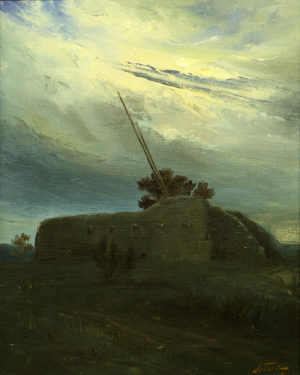 Lotave taught at Bethany College until the spring of 1899 when he left for Colorado where he completed assignments for the Smithsonian as a painter of the American Indian for more than a decade (1897-1910). Later, in Santa Fe, Lotave completed a number of murals for the Palace of the Governors – two for exhibit rooms and three for the entrance. He then left for New York where he gained a stellar reputation as a portrait painter; he painted many portraits of leading generals during World War I. He also illustrated for Mountain Sunshine and Success magazines.